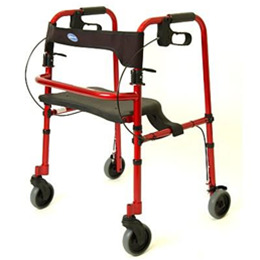 The Invacare Rollite Rollator features a lightweight, durable aluminum frame and convenient hand brakes. A flip-up seat and flexible backrest provide a place to sit down when needed, and the rollator conveniently folds for easy storage and transportation. Width Inside Hand Grips:: 18.2"
Seat To Floor Height:: 19"-23"